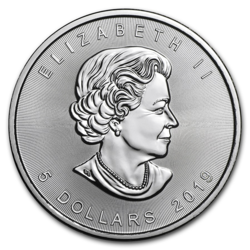 With GoldBroker, you can purchase 1oz silver coins issued by the U.S. Mint, the Austrian Mint and the Royal Canadian Mint. All our coins are sold in “Monster Boxes” of 500 units. They never leave the professional storage units from the time of fabrication and are sealed. Their whereabouts are tracked and their silver purity is guaranteed to be at least .999. Your coin investment maintains its maximum resale value. 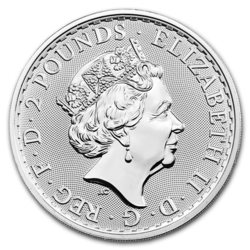 First, but not necessarily foremost, silver coins are legal tender in their countries of origin with guaranteed values by the governments which have had them minted. Why not foremost? Because their silver content is worth far more than the value inscribed on them. While their actual value could theoretically fall below that face value, there is a probability of near to zero that the price of silver will ever drop to less than one dollar per ounce, the international reference for coin weight. The value of a silver coin is driven by its rarity and desirability as a numismatic (collectible) piece. 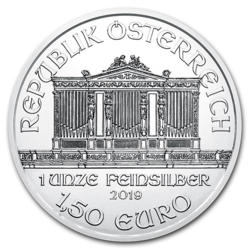 Adding the costs of design and production, silver coins come with premiums that increase purchase prices as much as 20% over the metal’s market price. GoldBroker.com nonetheless understands the allure of silver (and gold) coinage and procures it with care for quality to discerning customers. Please read on, below. What rivals the beauty of a 1 ounce silver American Eagle coin? The depiction of Lady Liberty striding confidently in the light of a brilliant sun on one side and the powerful bald eagle and shield on the other may constitute, in any form, the finest representation of the United States of America. This is the official silver bullion coin of the USA, and the country’s only official investment-grade 1 oz. silver bullion coin. 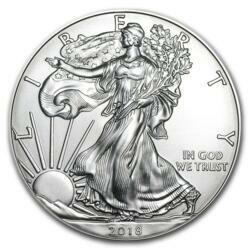 The design is based on the “Walking Liberty” half dollar which, in 2016, marks its 100th anniversary. GoldBroker.com also sources silver coins from other countries. We recommend you view the magnificent and intricate Silver Maple Leaf from the Royal Canadian Mint, admired around the world for its impeccable attention to detail and its peerless purity of .9999. Silver coins must exceed a fineness of .999. 100% purity is essentially unattainable. All of the silver coins that we have on offer are sold in what are called “Monster Boxes.” These are units of 500 coins, sealed and tracked from the time of mintage through storage to when they reach you as their rightful owner. GoldBroker always feels privileged to fulfill such an order because it speaks to the human appreciation of craftsmanship and the recognition that symbolism is important to life. But our approach to investment is straightforward. The GoldBroker solution is direct ownership and storage of physical silver and gold with no intermediation. Your wealth is protected outside the banking system in secure vaults located in New York, Toronto, Zurich and Singapore, and to which you have personal and private access on short notice. Or, if you wish, your coins will be swiftly and discreetly delivered to your address through our insured shipping services. You also have the option of picking up your order at one of our vaults. In the days of the Roman Empire, sailors hid silver coins under the mast or in the keel of their ships. This practice is repeated on occasion to this very day by athletes, in advance of their big game. They say it brings them luck. Who is to say they’re wrong? Store your precious metals in a secure vault outside the banking system, in New York, Toronto, Zurich and Singapore. Full-name ownership, insurance and direct access to the vault. Withdrawal of your gold and silver in our storage partner's world-class vaults. We deliver gold and silver bullion to the United States or any international destination through our insured shipping services. Complete the online application form. A confirmation email will be automatically sent to you. Forward the following documents: A copy of your passport and a copy of proof of address. Select the desired products and service then confirm the order by filling in a credit card. Transfer the necessary funds to pay your order by bank transfer.